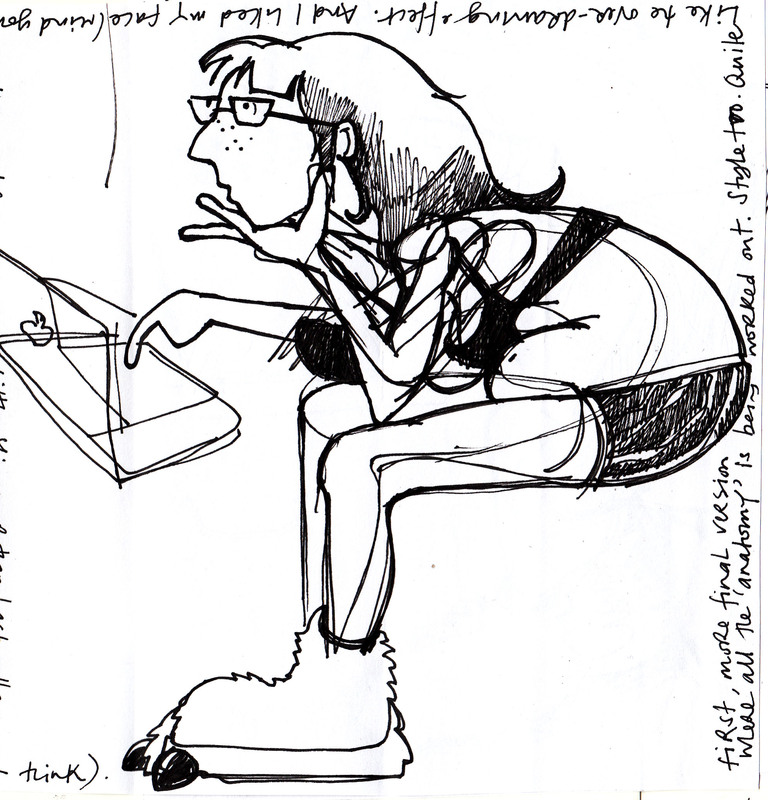 I ought to just briefly mention that the inspiration for drawing myself blogging (one-finger typing) in my underwear comes from a book I have considered purchasing, called “Freedom is Blogging in your Underwear” by Hugh Macleod. The upshot of this is that I am, in fact, just as likely to be seen blogging in a freshly pressed shirt and designer jeans whilst my children sleep soundly upstairs after heartily devouring a plate of vegetables whilst discussing the finer points of the Oxford Reading Tree. Besides clarifying that I am not really a careless mother with her head in a laptop (well, not always), I thought I’d post a few images of how that drawing happened. I mean, the process of drawing it – not the idea. Because it might be the drawing process itself that will change whilst I study on the MA; so why not expose that, examine it? My instinct is to hide those few, terrible, first sketches. This would help to encourage the idea that I am a Mozart-like genius who produces ‘perfect’, uncorrected drawings on the first attempt (actually I would still perfect the sketch yet). 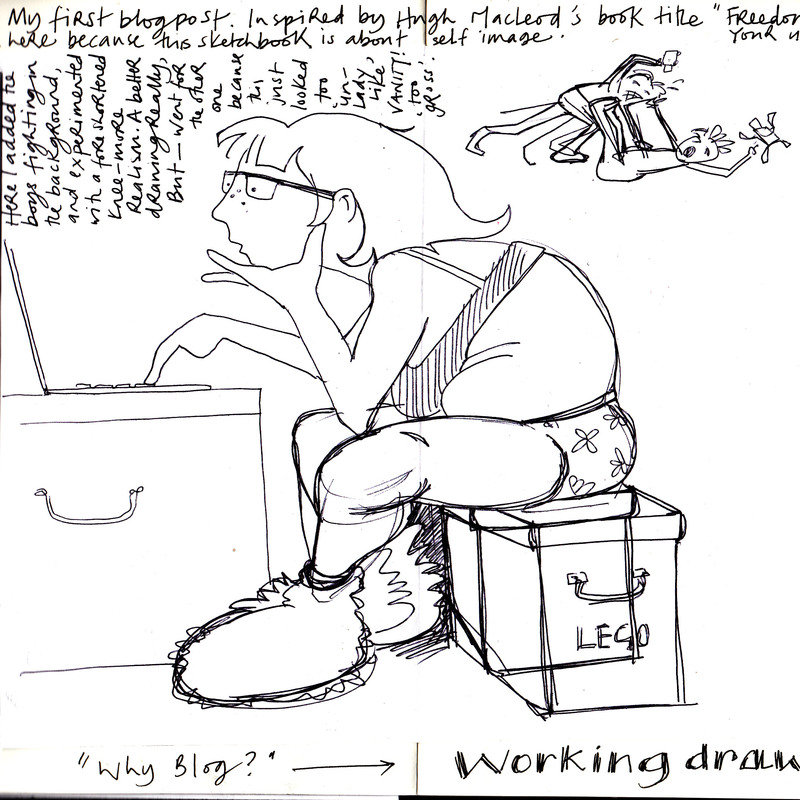 Instead I am going to show all the awful messes that led up to the drawing I published on the ‘Why Blog?’. I am very interested in the creative process of other artists. How do professional illustrators arrive at these wonderful, finished drawings that seem to me to be so flawless and ‘complete’? So, as part of this idea that here is where I ‘expose’ myself (ha ha – underwear! ), I am allowing a peek into my less-than perfect, less-than-genius process. Now, is the process of drawing a scene from the imagination something that I will get better at? Or will the final drawing be the thing that changes, a different style? More confident mark-making or use of colour? A more accurate drawing? A more ‘polished’ look, or less? What I am looking for is a clearer idea of who I am as an artist, not just as an artist that ‘outputs’ but as an artist who communicates. This is part of that journey. I am desperate to begin.